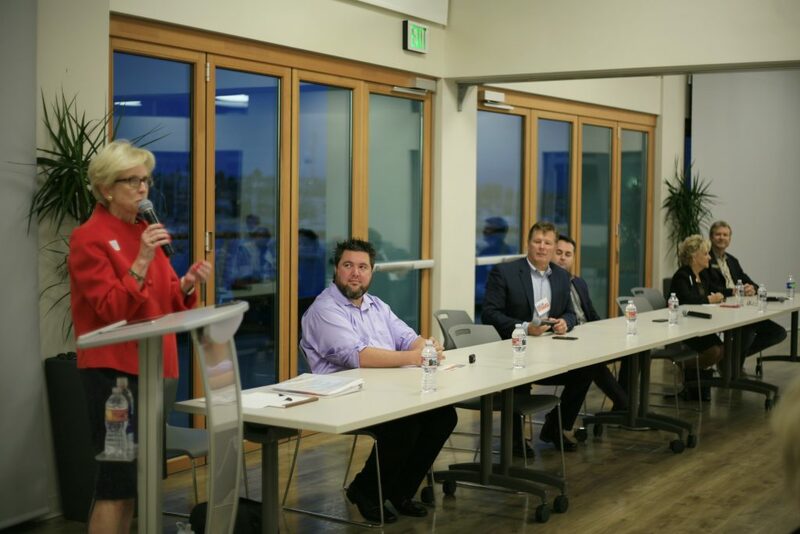 Newport Beach City Council candidates (right to left) Scott Peotter, Joy Brenner, Kevin Muldoon, Tim Stoaks, Mike Glenn, and Diane Dixon, at the Central Newport Beach Community Association and Peninsula Point candidate forum at Marina Park on the Balboa Peninsula on Wednesday. 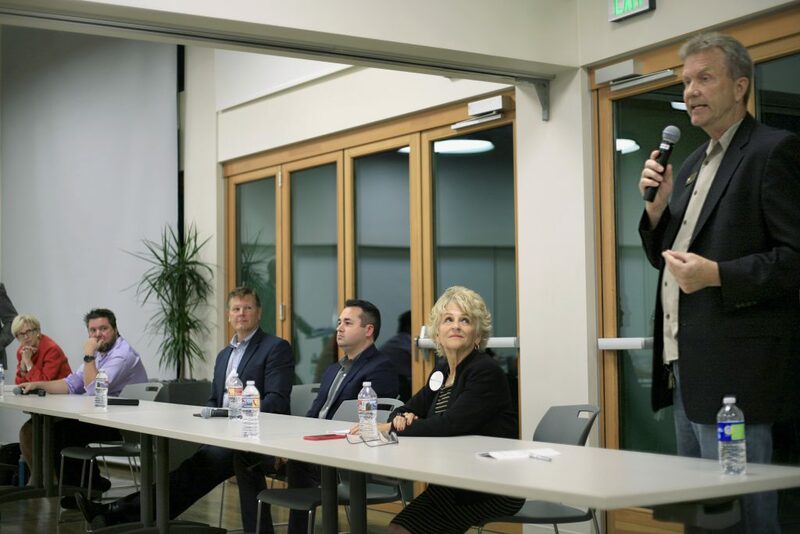 At the final public forum for the 2018 Newport Beach City Council candidates, the audience was more involved and outspoken, creating some tense, heated, and impassioned moments. Members of the crowd often interacted directly with some of the candidates, calling out questions and pressing for answers, applauding loudly at times and sometimes laughing. Central Newport Beach Community Association and Peninsula Point held the event Wednesday at Marina Park on the Balboa Peninsula. 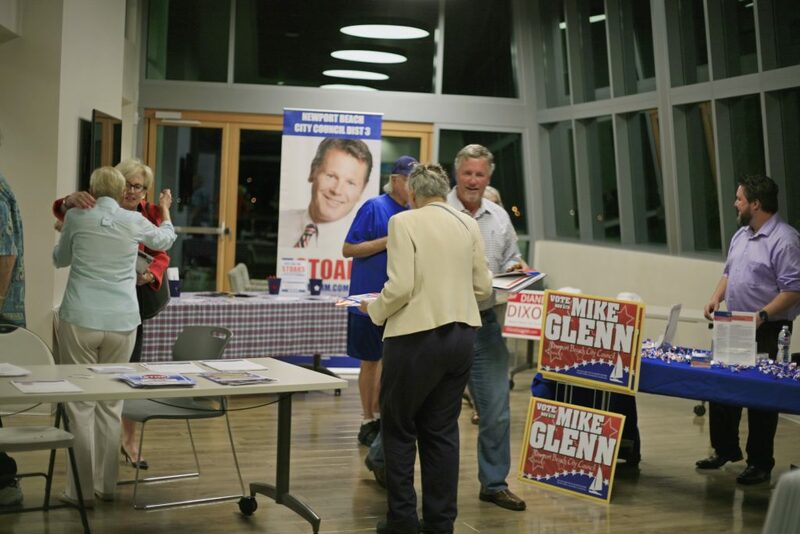 The liveliest moments occurred between the candidates in the races between incumbent Scott Peotter and challenger Joy Brenner in District 6, and incumbent Diane Dixon and challenger Mike Glenn in District 1. There are “very clear differences” between Brenner and himself, Peotter said. She’s Republican, yet she gives to liberal republicans and democrats, Peotter said. Brenner immediately said, “No,” while Peotter was listing a few names. He added that she hasn’t endorsed or supported any projects, only opposed certain issues. “I can only go by what the record is,” Peotter said. Peotter criticized Brenner, saying she only follows the current popular opinion, rather than forming her own comments. Moderator Tom Johnson took some time to ask the candidates about specific previous comments, rumors, and opinions. The candidates were allowed to reply, which prompted some back and forth arguing. Johnson asked Brenner about the complaints of partisanship in her district’s race. They are supposed to listen and take care of the needs of everyone in the city, she added. 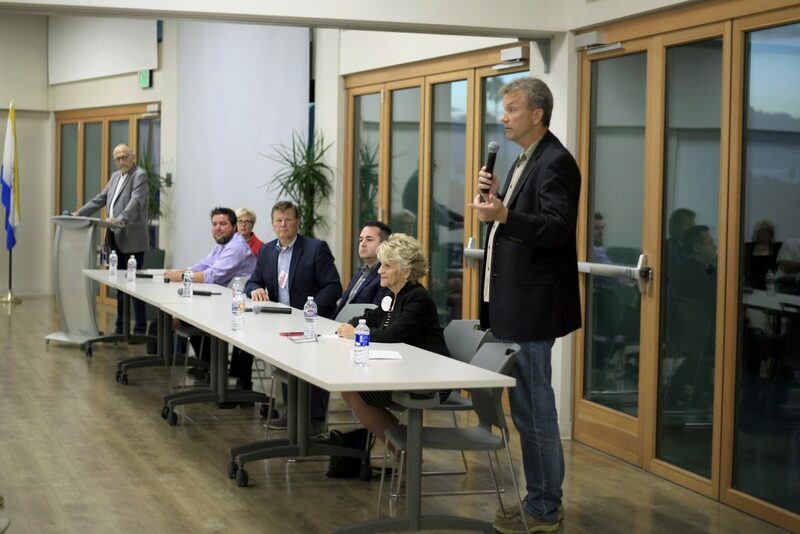 Councilman Scott Peotter (right) makes a point while his fellow Newport Beach City Council candidates listen at the Central Newport Beach Community Association and Peninsula Point candidate forum on Wednesday. “He keeps bringing up these issues that try and divide us, which is very calculating because if you can divide us, if you can get us fighting about things, if you can get us disagreeing, we’re not focused on the issues,” like maintaining a healthy environment with dynamic, but not high, growth, Brenner said. Things that residents, as a community, want, she added. His philosophy is conservative, which would be considered Republican, Peotter explained. In probably the tensest moment of the evening, Johnson asked Peotter to comment on the speculation that he is tied financially to current Mayor Marshall “Duffy” Duffield, who is up for re-election and did not attend Wednesday’s forum. “So you want to explain what the allegations or the rumors are?” Peotter asked. Johnson told him to go ahead and confirmed that he would like Peotter to respond. The audience laughed and protested, a few asking loudly if Peotter could elaborate. When Johnson asked if he said Duffield “was a client,” Peotter clarified that was not what he said and reiterated that he won’t talk about clients. Johnson pressed for more details, and asked again later during the portion of the forum when audience members turned in questions, but got the same answer. “I answered your question,” Peotter replied. Some more debate came from the candidates in District 1, which covers the Balboa Peninsula and some of West Newport. Dixon criticized Glenn for posting her home address on social media, a move which some residents have said was a “questionable” thing to do. 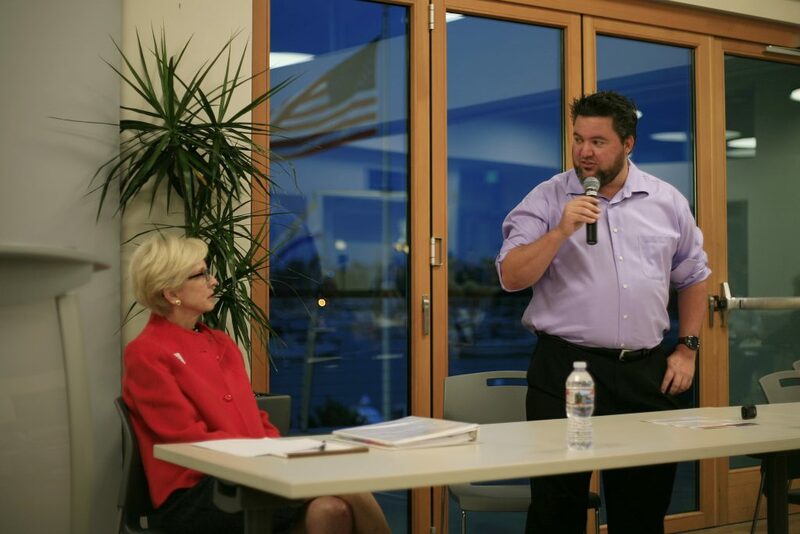 Diane Dixon speaks at the Central Newport Beach Community Association and Peninsula Point candidate forum at Marina Park on Wednesday. By disclosing her residence as a “public meeting place” and encouraging people to protest at her home, Glenn violated her personal privacy, Dixon said. “I find this highly offensive,” Dixon said. 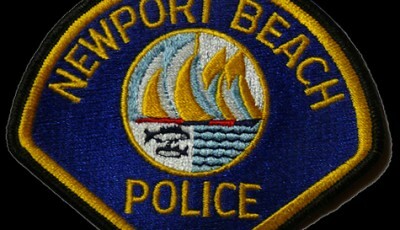 It’s not behavior befitting of a candidate running for public office in Newport Beach, she added. “This is the kind of activist politics we are seeing in Washington D.C., in your face politics,” Dixon said. This is a democracy, she continued, people are encouraged to come to city hall, speak out at a Council meeting, or attend one of her numerous town halls, but not protest in front of people’s homes, Dixon said. Glenn responded by stating his address. Dixon later replied by saying she didn’t recall getting calls or text messages from Glenn. There was quite a bit of back and forth between Dixon and Glenn, replying to claims the other made. Johnson asked Glenn about his frequent criticisms of Dixon and that he often sounds angry. “My big, booming voice, I sound angry about everything, but I’m really not,” Glenn said. As she is on the receiving end of Glenn’s comments, Johnson asked Dixon how she responds to it. Challenger Mike Glenn Makes a point about his opponent, incumbent Diane Dixon, during the forum Wednesday. It’s “bewildered” her, she noted. “I can’t get inside his head, I do not know,” Dixon said. “Public policy can be debated, that’s what we’re here for, to take a position and defend it,” Dixon said, reiterating that she stands by her record. She mentioned several Peninsula projects, including the Balboa Peninsula Trolley, which Glenn “makes into a cause,” but is something she’s proud of, Dixon said. These are projects she should be taking a lead on, Glenn responded, adding a few other projects to the list, but they end up being bad deals for the city and the residents, he commented. Some of the developers or property owners then become political donors, Glenn asserted. In another race, Johnson asked how Tim Stoaks has adjusted his campaign against an opponent who hasn’t shown up, as Duffield has missed the last five forums. Stoaks said he’s simply pointed out the difference between he and Duffield, that he will focus on more than one issue, Stoaks said. “I agree that the harbor is a very special issue,” it’s part of what makes Newport Beach unique, Stoaks commented, but there are other issues in the city that need attention, like the airport and the General Plan update, including getting control of the number of exceptions and variances approved. “I love this city, but it’s going in the wrong direction and I think we deserve better,” Stoaks added. In the fourth race of this year’s election, Johnson asked incumbent Kevin Muldoon about the 2014 self-dubbed “Team Newport” and voting blocks on Council. Muldoon’s opponent in District 4, Roy Englebrecht, was absent. “I’ve never heard of Team Newport, is that something you just made up?” Muldoon joked. Councilman Kevin Muldoon answers a question at the forum on Wednesday. Muldoon added that it was a one-time promotion for that campaign and he’s “gotten flack for it ever since.” It feels like a contest sport and he ended up with a lifelong jersey he “didn’t ask for,” Muldoon said. He’s running on his own, there is no slate this year, Muldoon confirmed. He also stated there is no voting block on Council. “I am often the lone dissenter among all the Council members,” Muldoon said, adding that the current Council lineup often votes 7-0 or 6-1. “I do my best, I’m not always perfect, to try to listen the voters and do what I think is right,” Muldoon added. At one point, things got a little heated as Peotter asked for time to respond to other comments. Johnson declined, saying they were moving on. Peotter pointed out that Dixon responded to Glenn several times. But Johnson maintained his decision and somewhat jokingly said in a couple years Peotter could take the podium and moderate the forum. “Tom (Johnson), you know I’m not running against you, right?” Peotter asked. “Oh, I would never run against you,” Johnson replied. An issue that has been mentioned at several of the candidate forums this year is the Museum House condominium project. It was approved by a 6-1 Council vote in 2016, petitioned by residents, and overturned by a 5-2 vote from a slightly different Council lineup in early 2017. A couple of residents have brought the 1,100 page, 10-pound petition, which included the entire EIR document, to several of the forums. She’s tired of fighting through petitions, Brenner said. That EIR was a big part of their staff report, Peotter explained, the Council members had to read that in order to decide on the project. So it made sense the voters would be able to look at it, if they wanted to, he added. If the developer follows the “rulebook” of the general plan, city charter, and zoning code, and other city regulations, they expect to be approved, not for Planning Commission or City Council members to “arbitrarily” decide against a project, Peotter explained. 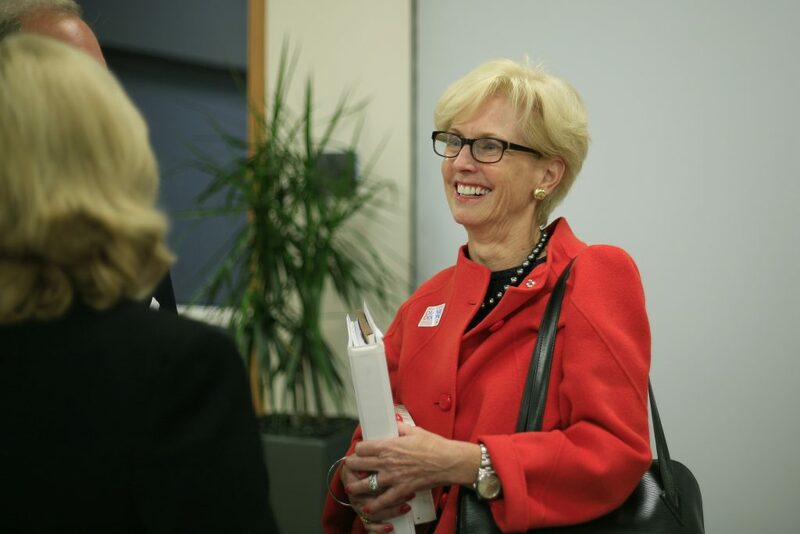 Councilwoman Diane Dixon chats with residents after the candidate forum on Wednesday. The Museum House complied by the rules, passed both the Planning Commission and Council, residents submitted a referendum and the decision was rescinded. “So the system worked,” Peotter said. In the original 6-1 Council vote for Museum House, the lone dissenter was former Councilman Tony Petros. At the time, Petros explained his no vote by saying he had to vote with the will of the people, as many residents had voiced their opposition to the controversial project. Although he agreed with the findings of the EIR and appreciated the architecture of the building. Residents overwhelmingly voted against measure Y, a clear statement that they don’t want more development in this area, he explained. 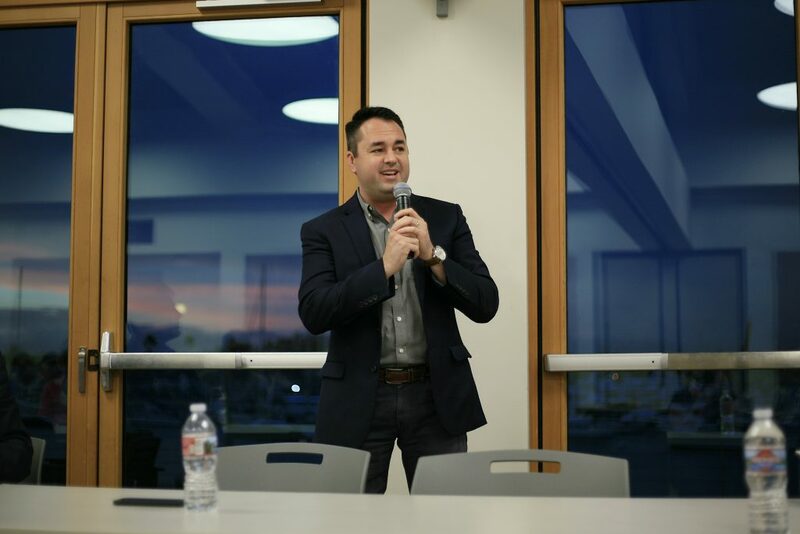 Other topics of the night included development, traffic, parking, exceptions and variances, shared mobility scooters, boardwalk safety, and candidate fundraisers. 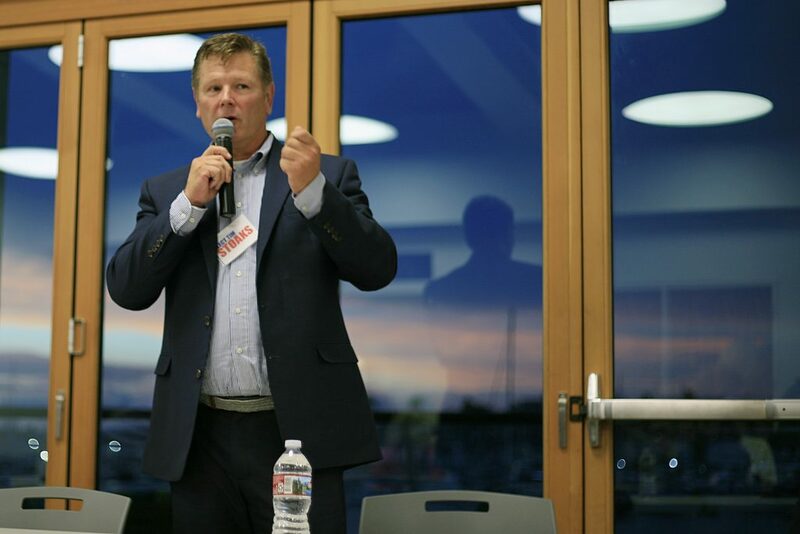 District 3 Challenger Tim Stoaks speaks at the Central Newport Beach Community Association and Peninsula Point candidate forum at Marina Park on Wednesday. Council candidates talk to residents and pack up materials after the forum on Wednesday.